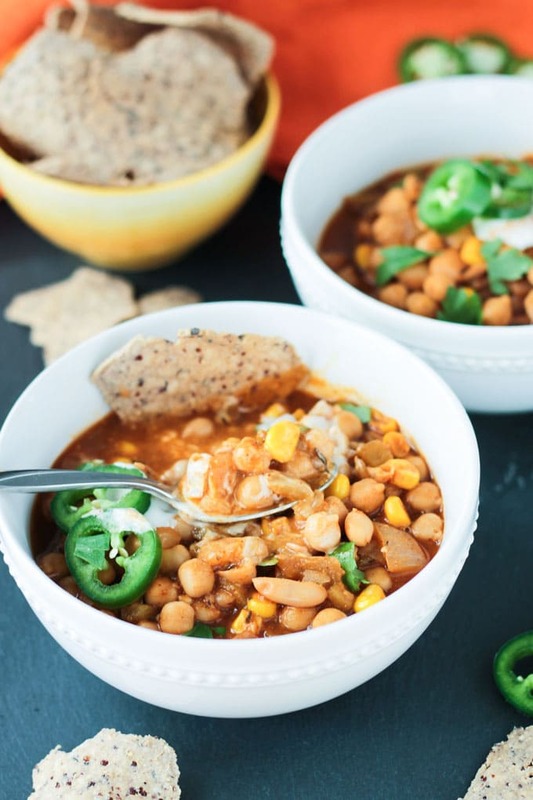 Chickpea White Chili – a quick and easy vegan white bean chili perfect for any day of the week! We are having an exceptionally mild winter so far here in the midwest, but that doesn’t stop me from making all the cozy soups and stews. 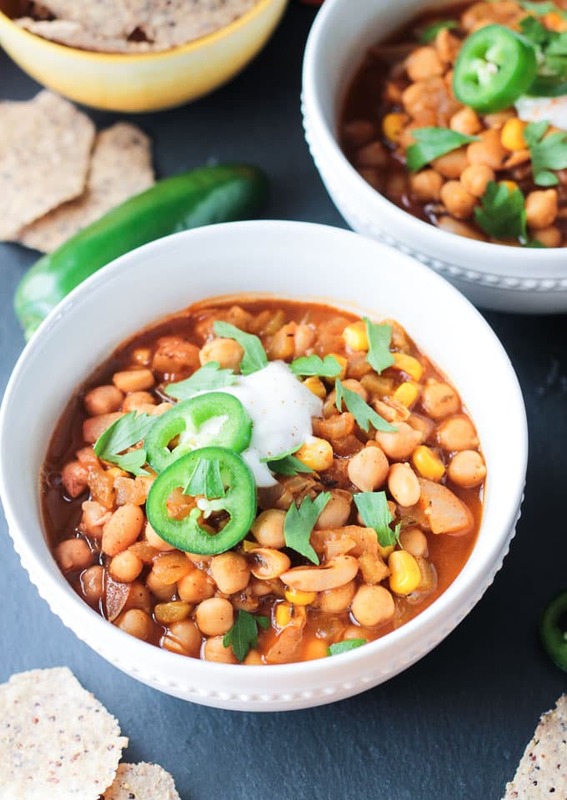 I really love hearty chills in the cooler months and I decided to do things a little differently this time by making a white bean version. This Chickpea White Chili has all the spice and depth of flavor of regular chili, but no tomatoes anywhere in site. 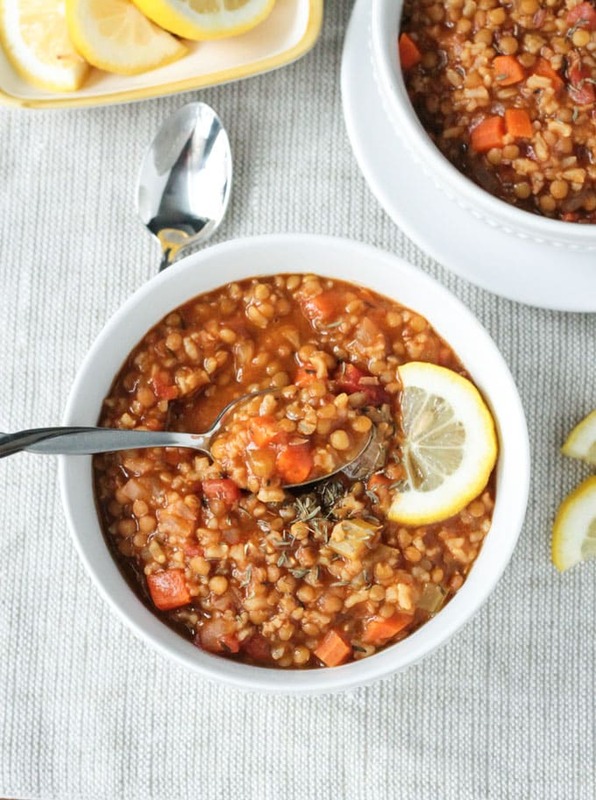 If you like thick and hearty one pot meals, this comforting dish is for you! 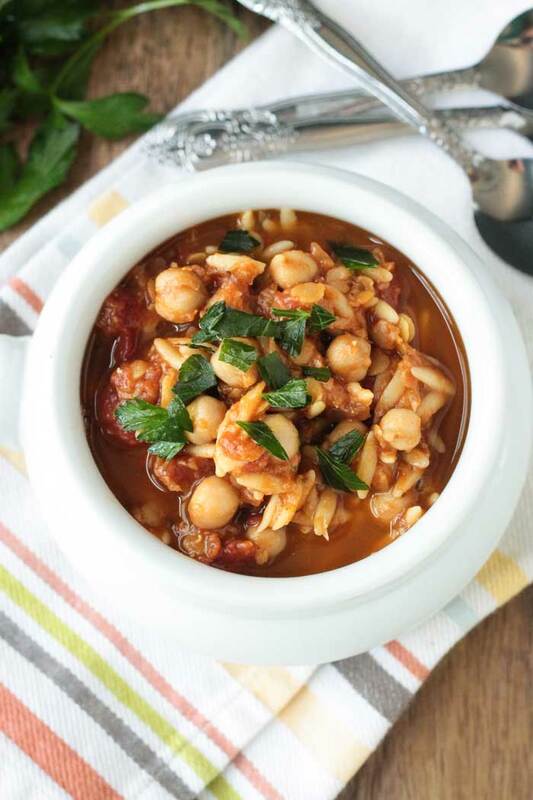 I used two kinds of white beans in this chili: cannelini beans and garbanzo beans (chickpeas). The cannelini beans provide a nice creaminess while the chickpeas hold up really well and still have a little bite. I really like the contrast in texture in this recipe. I added canned diced green chiles and also a fresh jalapeño for heat. You can leave out the fresh one if you don’t want it spicy at all. This white chili only needs 20-30 minutes of simmering to bring all the flavors together, making it perfect for any day of the week. It would make a great addition to any football watching party as well…make a double batch and keep it warm in the crockpot. 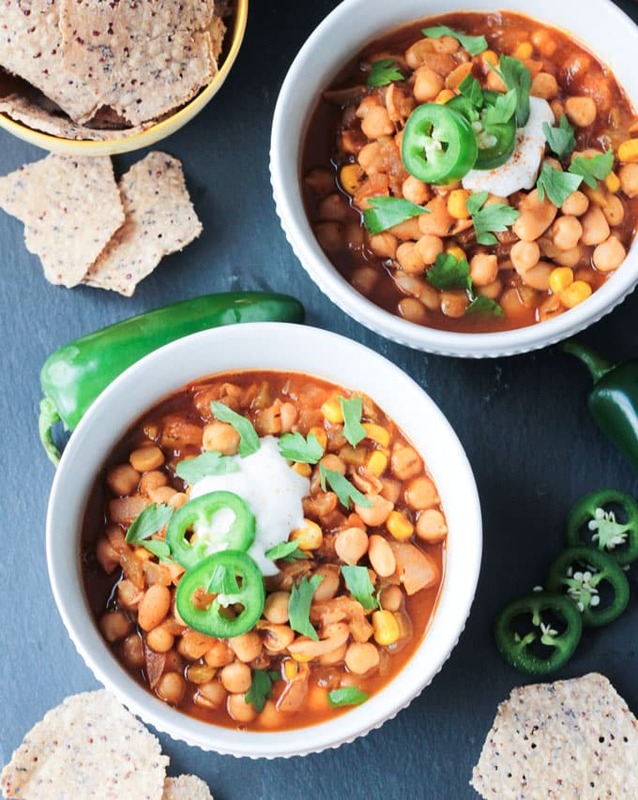 Feel free to top this white bean chili with the toppings of your choice. I especially loved the tanginess of a little dollop of dairy-free sour cream stirred in right before eating. Fresh cilantro, avocado, or sliced jalapeño are great choices as well. And I have never eaten a chili without tortilla chips for scooping – at least not in my adult life where I get to make my own food choices. 🙂 Tortilla chips and chili just go hand in hand if you ask me! My kids happily ate bowlfuls of this too. They are such bean lovers…makes me so happy! I hope you love this White Chili just as much as we do! If you try this recipe, please come back and leave me a comment below with your feedback. You can also find me on social media. Be sure to tag @veggie_inspired and #veggieinspired so I’m sure to see it! Enjoy! 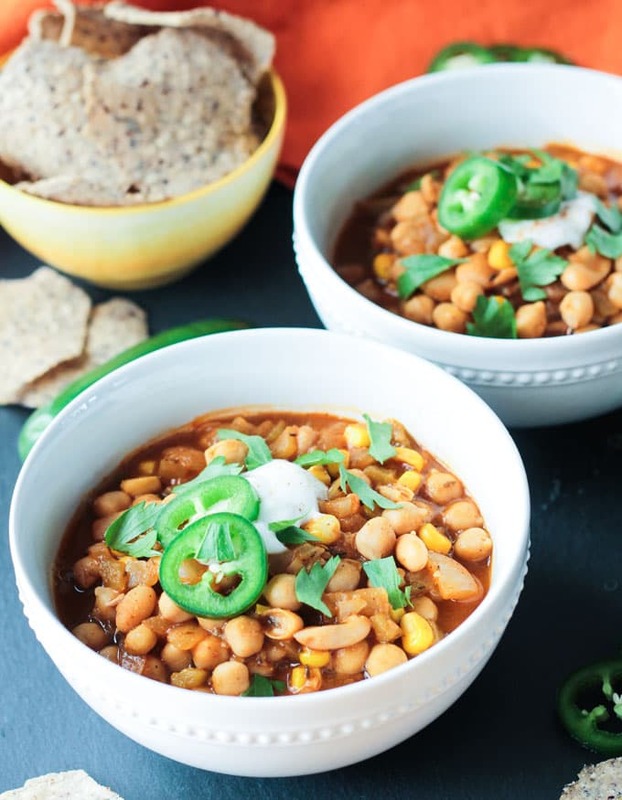 Chickpea White Chili - a quick and easy vegan white bean chili that's perfect for any day of the week! Saute the onion, garlic and jalapeño over medium heat in soup pot on the stove for 5-7 minutes. Add the beans, diced green chiles and all the spices and mix well. Add the broth, stir, and simmer for 20-30 minutes. Add the corn and simmer another 2-3 minutes. Nutrition facts calculated without toppings. I made this recipe for the 1st time today for a guest who is hard to please. Wow!!! Was this a hit!!! The meal was easy to make & was ready to eat in a snap. The chili was full of spice & filling on a cool day. Thanks for a recipe that will be made often. That’s so wonderful to hear, Dianna! Thank you so much! This was so quick and easy to make. I liked the seasoning; however, my husband would like it cranked up a bit more. So, next time, I’ll add a bit more smoked paprika and chili powder. Thank you for such a healthy recipe! Thank you, Sara! I’m glad you liked it! For sure, add more spices if you like the heat! An extra jalapeño or two…or even a few dashes of hot sauce before serving. I try to make everything very kid friendly. My kids do like spicy things, but not to the level that some adults can tolerate. LOL! Thanks for the feedback!! I just realized that perhaps I was supposed to have used the entire jalapeno. Should I have used the seeds and all…which would have kicked up the spiciness that my husband was asking for? (I haven’t cooked a lot with jalapenos.) Thanks! You certainly could, Sara! I almost always remove the ribs and seeds because I’m cooking for my kids, too, and I don’t want it too spicy for them. But, if you guys like more heat, definitely add them in! Yum!! This looks seriously fantastic! Nothing like a great chili to cozy up to on cold winter days!! That’s exactly how I feel!! It’s so homey and cozy! Thanks!! This looks fantastic, and I love the short time frame from start to eating! The mild winter has been really nice, I can enjoy cozy soups and ice cream all in the same day 🙂 But yeah I have a feeling when the cold comes it might hit hard, so I will need lots of warming meals like this! Thanks, Natalie! I eat soup and ice cream all year round anyway, no matter the temperature! But, yes, I’m kind of terrified to see what January brings since December has been so nice (except for all the yucky rain!). This chili looks amazing Jennifer!! Chili ranks up there in my top 5 foods. I could live off of it, all kinds, and this one is gorgeous and all those amazing flavors you got going on! I’d love a bowl right now. It finally is getting cooler here in Texas. Fabulous recipe! Oddly, it was 61 degrees here yesterday. So incredibly odd for this time of year. But it’s also been raining the last several days, which to me just screams chili! Thank you, Brandi! Thank you, Lucie! I add smoked paprika to nearly everything…I love it so much too! You sure know how to make the best feel-good dishes. I love those toppings too… I usually just give people a bowl and say ‘that’s all you are getting’ 🙂 Beautiful! You are so sweet, Trinity! I do love my comfort food! And I find that a variety of toppings always makes it fun for the kids…a way to make it their own! If by mild winter you mean pouring buckets of rain from the sky for endless days, then we here in the Pacific Northwest are having a mild winter indeed. 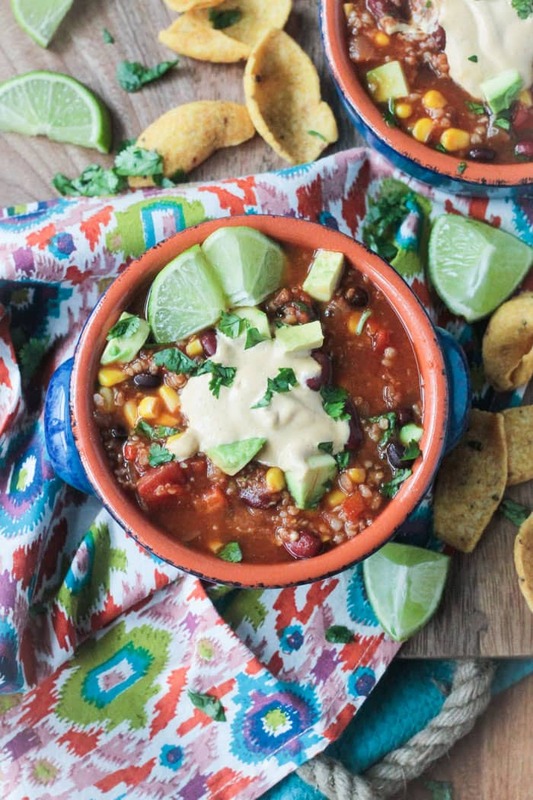 This chili looks like the perfect way to warm up! Can’t wait to try it. Oh no, Beth, that doesn’t sound nice at all! This definitely sounds like a meal you need! Nothing better than fresh summer sweet corn, but I’m always stocked with frozen all year round just in case! Thanks, Rebecca! If you do that, I’m coming over too!! I LOVE fire pits, but it’s usually too cold by the end of October. It’s gross, rainy, foggy today, but you almost don’t even need a coat….so weird…and pretty awesome. Thanks, Linda!